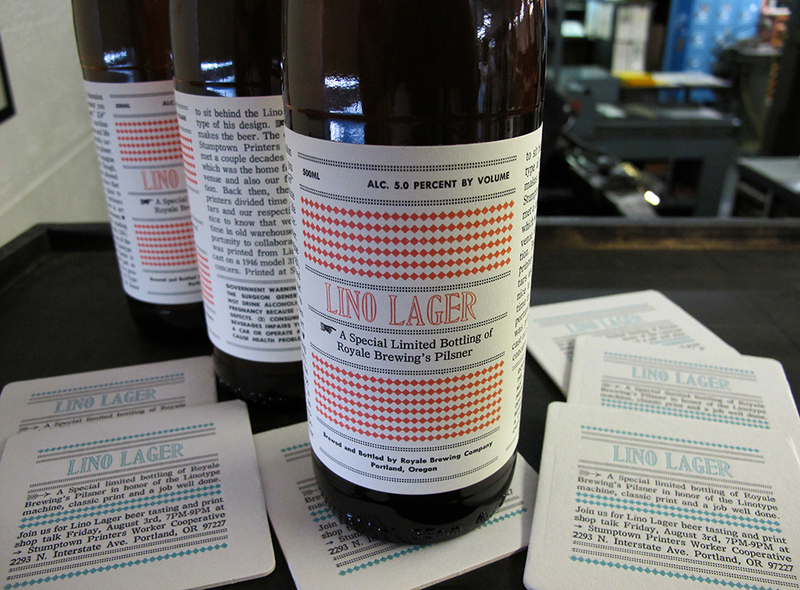 The Lino Lager label has been archived in "Fonts in Use!” Thank you Nick Sherman for the write up and for adding it. The cap of the last Lino Lager has been popped and this limited bottling is long gone, so it's a good time for a follow up. Several Linotype enthusiasts gave themselves a break from their “etaoin shrdlu” keyboards long enough to take a “slug” of this project - it was a good excuse to catch up with fellow line-casting and hot-metal print misfits. Thanks to Linotype operator and Baltimore Museum of Industry volunteer Steve Cole, the beer made it to the birthplace of the Linotype machine and Ottmar Mergenthaler’s long time home: Baltimore, Maryland. Steve Cole and Ray Loomis enjoyed a couple “slugs” of the Lino Lino lager after their volunteer shift at the museum, and properly honored the machine and the man with their celebration. Our good pals Dave and Gnu from Dayton, Ohio couldn't make it, but they sent flowers to arrive in time for tasting event to help class the joint up a bit. Thanks guys! Mr. Doug Wilson, director of “Linotype, the Film” broke away from the busy schedule at TypeCon and was able to join us at Stumptown Printers for the tasting party. It was very nice to catch up with Doug, talk Linotype machines, socialize with other TypeCon attendees, and to have more than a couple tastes of the then-two-day-fresh Lino Lager by Royale Brewing. Thanks for the info, Frank. Like an old pro, Amy Redmond knew what to do with her bottle of Lino Lager. She sat on the stoop of her pal's house while visiting Portland and slugged it down after delivering a killer talk at TypeCon earlier that day. A Lino Lager made it out to the Boston neighborhood of Jamaica Plain and into the clutches of my buddy and fellow Linotype operator Michael Babcock of Interrobang Letterpress. After it arrived, we jabber-jawed like a couple teenagers on the phone for about an hour while catching up and swapping Lino stories. Michael has been tuning up his machine and has been documenting some of his work here. His 31 is looking real clean, and he is putting a lot of love into it. Solid work. Speaking of work, Bill and Tristin Spurling of Linotype.org happen to be darn good brewers and Linotype mechanics and hard working fellas. Naturally a couple of Lino Lagers landed at their Linotype farm in Yamhill, Oregon. It was good to check in with the lads. Bill Washburn, Local craft printer, long time Linotype operator, mentor, friend, and pusher of lino-mats received a bottle of the lager, and as a result, it brought him out of his retired life and inspired him to visit us at the C.C. Stern Type Foundry. He's always got a good story, and it's always good to see him. The C.C. Stern Type Foundry crew are always game for hot metal and print, after the special TypeCon C.C. Stern Type Foundry open house, the foundry team along with TypeCon attendees headed to nearby Royale Brewing to have pints of the Lino Lager and continue discussions about type and metallurgy. Finally, the last 4 bottles traveled with us to the 2018 ATF conference hosted by M & H Type in San Francisco. As usual, it was an inspiring conference, and the crew at M & H did a fantastic job putting it all together. We put two of the bottles up on the auction block for the American Type Casting Fellowship fundraising auction. Auctioneer Greg Walters busted me by catching a typo on the label which I wasn’t aware of. Dang. A humbling blunder in that room full of master typographers and typesetters. Alas, Norman McKnight was a good sport and bid on the beers anyway, the sale of the beers raised a little money for the organization, and then Norman shared his winnings with the thirsty crew. It was an honor to pop the last tops of the Lino Lager at that event. A bottle made it to Colorado, where its contents were enjoyed by board members and volunteers at the Letterpress Depot. Myrna from Expedition Press stopped by the C.C. Stern Foundry during the TypeCon open house where 2 or 3 bottles stowed away with her back to the Expedition headquarters in Washington state. Also, apparently a full bottle *still* exists within the worker's fridge at the Letterform Archive. Those folks hosted a special viewing of select materials from the archive during the American Typecasting Fellowship Conference. It was an amazing presentation and curation of the collection. Thanks for that, guys! As for the currently un-opened lager, I'll present you with this caveat: The lager is delicious when fresh, but the longer it sits, the more the taste resembles the first part of the name rather than the second. So if you decide to drink it, please keep that in mind!